Not since 1969 had the Aloha visited Santa Cruz California. True, there are bits and pieces of it floating around, but true and pure Aloha has been vastly missing. It was May 3rd, 2008 on a clear blue day with a nice little two to four foot south swell. The day had taken some string pulling to accomplish but it was now happening. The venue was set at UCSC’s media center; books and tickets were being sold at the Patagonia store, and the UCSC bookstore. The money from the ticket sales ($5 each) was going to the Ride a Wave foundation and the UCSC Recreation Department Scholarship Fund. The day’s events were scheduled and it was go time. Something was in the air: Aloha. Gerry Lopez was in Santa Cruz on a book signing tour for his new book, Surf is Where You Find It. Some of the staff from Pat. Santa Cruz pose with the man (L to R): Alex, Ray, Gerry and Tim. The coconut wireless was buzzing as many of the town’s ambassadors of surfing, forgotten friends, worshipers, and self appointed mayors started to gather around the return of their king. I got the phone call from Gerry, “were about four miles from the beach, meet us there.” By the time I got there a small and very happy crowd had gathered. Most of this crew was with Gerry in one way or another with their Aloha flowing. As we chatted, surfers from all walks of life started to approach Gerry, most he knew from their visits to Hawaii. As the sun beat down and the temperature rose we knew it was time to hit the water. Gerry and his buddies were using SUPs (stand-up paddleboards) but I opted for my trusty 10’4” nose rider. The place we surfed is fairly “private” but the line-up was not. In an attempt to avoid the crowd we decided to paddle in between two spots and found ourselves on a nice rolling point-like wave. It was glassy and consistent with two to four foot waves but, of course, some bigger sets came in to Gerry. Gerry was surfing like he always does, in total control of the situation and in tune with Mother Ocean. It’s funny that both times I have had the pleasure of surfing with Gerry it has been in backside waves. Being a goofy foot this might seem like a letdown, but not so.Most of my life I have been surfing backside waves and watching Gerry’s backside surfing was pure brilliance and inspiring. Gerry always seems to be able to show other surfers the correct way to do things while displaying the Master style. On the SUP, which he surfed like a shortboard, he had a way of rotating the board around once he spotted the wave he wanted. I have seen plenty of SUPs as of late but this was something new. He changed his stance for a brief second, stepping back, and the 10’ board was turned and ready to paddle into the wave. This move, which no one else was doing, was so quick and effortless nobody noticed he was doing it. In true Lopez form, style school was in session. We surfed for about three hours, basking in the glory of the day. Some people paddled over and introduced themselves to Gerry, other watched like it was a movie. The Lopez crew was switching boards, going tandem with close friend John McMahon’s daughter (she was so stoked),taking pictures, chatting, and loving the fact that they were in SantaCruz and it was uncrowded. In Santa Cruz, “Surf City USA” fun, glassy, uncrowded surf is not commonplace. With Aloha present everything was happening just like magic. Toward the end of the session Gerry paddled up to the next spot. As he did, the biggest set of the day hit and he was on it. Gerry took off on a head-high wave and “S” turned up and down the wave, taking the high line a few times to make the sections. He rode right passed us continuing on through the next section. Everyone in the water saw it!All watched in awe and while most hooted for Gerry, some started to clap. After the masterful display of surfing and all the good vibes floating around it was time to get an early dinner before the night’s big show. An hour later we all met up in downtown Santa Cruz at ElPalomar Restaurant. We had a very relaxing dinner with plenty of stories being shared. The portions of food at El Palomar are out of control, so we were sure to warn Gerry and crew not to fall prey to the could be food coma. No time for naps, we have to go entertain four hundred people!! I hitched a ride with John and Gerry to make sure they knew how to get to the Media Center, but the signs were everywhere “Gerry LopezTonight – UCSC Media Center.” They couldn’t have missed it even if they wanted to. As we approached the venue a small crowd had already formed, we were an hour and fifteen minutes early! I introduced Gerry to the UCSC people and we got started checking the equipment and venue.The seating allowed great views for all of the gigantic images been shown directly behind Gerry on the stage, and the sound was perfect.Later Gerry told me it was the nicest venue he had been to thus far. Everything was set, only thirty minutes until the show started. The line was forming outside, and most of the books had been sold by now.Gerry asked if the crowd would like to come in so he could start signing some of the books. Judging by the size of the crowd this was another masterful move, otherwise we would be here late into the night.After about fifty people had books, tickets, pictures, and even surfboards signed we called it so Gerry could start the talk. The show started with a quick three-minute movie trailer for Ride a Wave foundation, which everyone enjoyed. Ride a Wave is a non-profit that organizes local expert surfers and lifeguards to take severely handicap children surfing. The movie was touching and once again the Aloha was flowing. After the trailer I had the honor of introducing Gerry, and after that he took over. He started by explaining his book and the reason he wrote it, followed with a reading from one of his favorite sections of the book titled “Pakala.” It’s about where Gerry grew up, an up close and personal insight into his childhood. The crowd felt how truly special this was to be honored by the Pipe Master’s personal life. The crowd was all smiles, a few even shed tears, as Gerry told his story. After this he went through the pictures in the book and explained in detail each shot, again very special insight. Next was the question and answer portion of the evening. This was believed to be the best part of the evening as the crowd had some excellent questions, andGerry had equally genuine answers. One person asked if Gerry had any advice for them, his response was “be nice to beginning surfers, we all had to begin sometime, we were all kooks at one time; give them good advice and give them a break.” This is exactly what Santa Cruz needs to hear. If anyone else in the world was to say this to them they wouldn’t listen, but this was Gerry Lopez so I hope it sank in and some warmAloha will spread in our frigid waters. This was a lucky group of people as we had gone two hours into an hourlong scheduled evening. Next was the crowd stoking give away. I asked a couple young local surfers (ages 9 and 11) to come up on stage withGerry and I. They were Ben and Sam Coffey and they are the sons of local shaper Ward Coffey. I don’t believe Ben and Sam will ever forget this night. I would pull a Patagonia product from a bag, the boys would call out a ticket number, and Gerry would give the product to the winner. The beauty of this was that the winner would get a few seconds with their idol, their legend, and they all showed it. Hugs, cheek kisses, handshakes, and huge smiles were at hand as Aloha shone fromMr. Lopez. This lasted about fifteen minutes then I thanked the crowd,UCSC, and Ride a Wave before we moved into the final round of book signings. Again, books, tickets, pictures, and some classic LightingBolt surfboards were signed. Everyone had his or her chance to share an up close and personal moment with Gerry. The best part is even thoughGerry was getting tired, as it was now close to 10 pm, he smiled and gave every person his undivided attention. Once again showing SantaCruz what true Aloha is. As the crowd was leaving, most, if not all, came up to me and personally thanked me and Patagonia for bring Gerry and the Aloha back to SantaCruz. They wanted more and asked when he would be back. My reply was when his second book comes out, but that his Aloha will always be here.As we left the UCSC campus, John, Gerry, and I were all relaxed. The surf was fun that day, dinner was excellent, the night was good, the crowd was happy, the venue was fantastic; what more could we ask for besides some rest? John and Gerry dropped me off at my house, we chatted for a bit and said our “see ya laters.” I wished him good luck on the rest of the book tour. 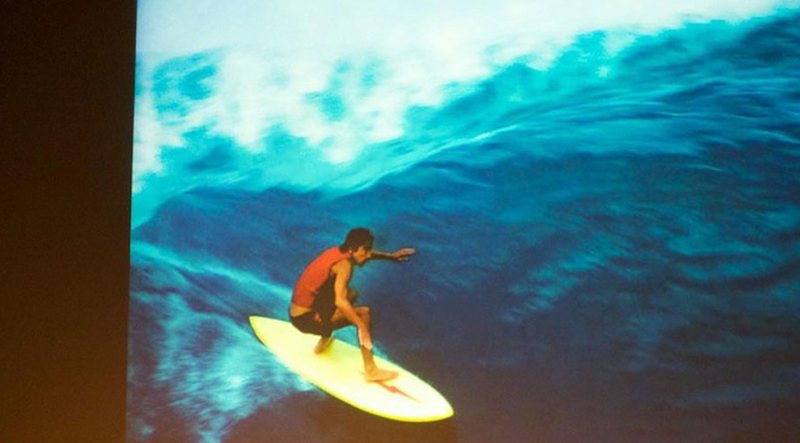 This was a day that Santa Cruz and I will never forget – the day Aloha returned. Past and present share the stage. Ben and Sam Coffey help Gerry and Ray with the prize giveaways. Danny Cortazzo, founder of Ride a Wave, gets the shaka. More staff from the Santa Cruz store: Cyrus, Lindsey, Ray, Colleen, Gerry and JT. Signing an old Lightning Bolt board. Gerry still makes classic Lightning Bolt boards if anyone’s interested. The question is: if you got one would you ride it? Many mahalos to Gerry, Ray and UCSC for hosting a great event. All photos by Jason Flowers.